There are countless people who will readily testify that this is an exceptionally quick means of acquiring constipation relief. Through this fast natural breath exercise, people may additionally reduce the suffering and pain of constipation along with the abdominal pain that it causes. This 100% natural exercise has been taught to thousands of patients by more than 160 Russian medical doctors. Spasms in the smooth muscles of the GI tract typically appear because of a shortage of two extremely vital chemical in the digestive tract, and the body at large. These are oxygen and CO2. How can that be? Well, the fact of the matter is that concentrations of oxygen and CO2 are typically controlled by our breathing patterns. For this reason, the answer to this problem lies in breathing normalization, or breathing in such a manner that it gets as close to the normal breathing pattern as possible. More than 80% patients have succeeded in acquiring constipation relief through this exercise, but it relied upon the instructions that were presented to them by their Buteyko breathing method educators. This is a 100% natural and easy breathing exercise that was invented by Soviet medical doctors in order to help people relieve constipation and the pain associated with it. This fast remedy for constipation was taught by them to thousands of their patients who suffered from chronic constipation – this included pregnant women and children, even 3 year old babies can do breath holding and reduced breathing. 1. Use your abdominal muscles or belly to take a slow inhalation – as if you are filling air in your belly. Relax the diaphragm to exhale. Blood oxygen levels are typically increased by this slow and deep breath considering that a majority of people who suffer from constipation are chest breathers. 2. Once you have exhaled, pinch your nose and hold your breath till the time that you start experiencing strong air hunger. However, make sure that you do not practice extended breath holding and use the easier version given below if you suffer from heart disease, panic attacks, frequent migraines and seizures. 3. Upon releasing the nose, do not follow your natural desire to take a deep breath. Instead, take a shorter inhalation via your diaphragm and then relax it immediately. The main aim that you must achieve is that of maintaining strong air hunger for about a minute or two, while having this reduced breathing with total relaxation of all the muscles of your body. By performing this quick natural constipation relief exercise, you will be able to achieve immediate freedom from constipation and possible pain due to increased O2 and CO2 levels. This set of people need to practice a different version of the breathing exercise to be able to relieve constipation. Their approach should be one focused on more gentle changes in O2 and CO2 in the blood and lungs. Rather than a sudden surge of CO2 (as is the case with breath holding), these people need to start with step 3 given above – reduced breathing while increasing air hunger levels gradually without holding the breath. Given below is a YouTube video that presents details about the same instantaneous exercise to help you relieve constipation now and instantaneously – Constipation Remedies: Cure in 1 min. Reduced ventilation has the potential to trigger gradual accumulation of carbon dioxide within the blood, lungs and all other tissues in the body. 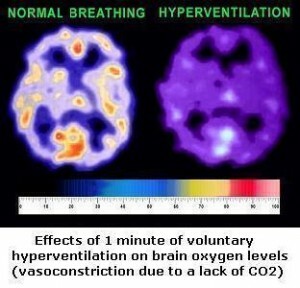 Remember, carbon dioxide is a natural muscle relaxant, a dilator of the arteries (CO2 vasodilation causing immediate dilation of blood vessels and better blood flow), restorer of the tone of veins along with being an instantaneous catalyst of chemical release of oxygen from hemoglobin (the Bohr Effect). All of your problems with pain from constipation and a number of other common symptoms of chronic diseases will disappear fast if you just retrain your unconscious respiratory pattern so that you attain over 25 s for the body-oxygen test.